Above: Gates for the new locks tower above the surroundings as they sit by the banks of the existing Canal while waiting to be installed. 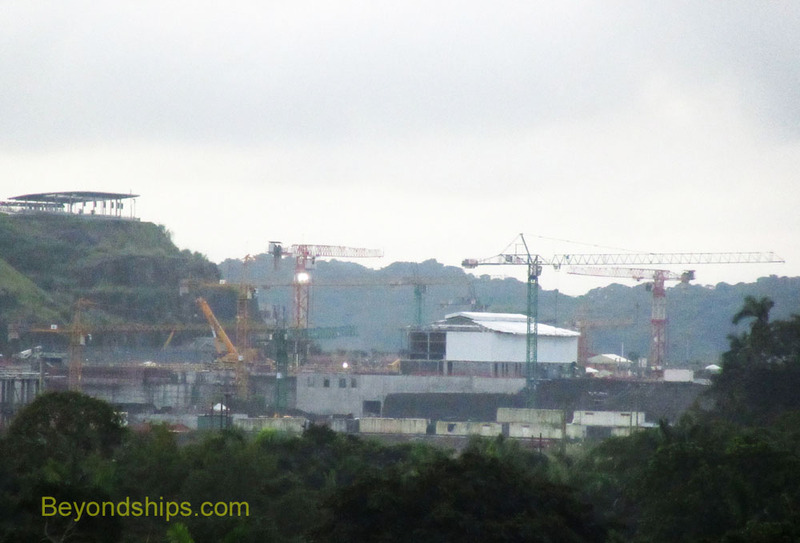 In 2007, work was begun on a $5.26 billion project to expand the Panama Canal. This project was undertaken essentially for two reasons. First, the existing Canal was nearing its maximum operating capacity. Second, many of today's ships are too big to go through the existing Canal and so a larger Canal is needed to accommodate such ships. The original Canal has two lanes, each with its own set of locks. The expansion project involves creating a third lane with its own set of locks. While the original lanes have three locks (Gatun, Pedro Miguel, and Miraflores), the new lane will have two locks. One will be located east of the Gatun Locks while the other will be southwest of the Miraflores Locks. The new locks will be larger than the original locks. They will be able to accommodate ships three times the size of today's Panamax ships. Because the new chambers will be wider, tug boats will be used to maneuver the ships within the chambers instead of mules. Like the original locks, the new locks will use water from Gatun Lake and like the original locks the water will be moved by gravity rather than by pumps. However, unlike the original locks, the new locks will reuse water. It will be shifted in and out of the lock chambers from basins located beside the locks. This is being done so as to ensure that Gatun Lake maintains enough water to operate the Canal and meet Panama's other needs. Rather than swinging gates as in the original locks, the new locks will have rolling gates that come out from the side of the chambers. Each of the new locks will have three chambers. The new lane will only use part of the existing Canal. Ships will get to the new locks on the Atlantic side via a new channel that exits the existing channel before the Gatun Locks. This channel was begun in 1939 by the United States but was abandoned because of World War II. 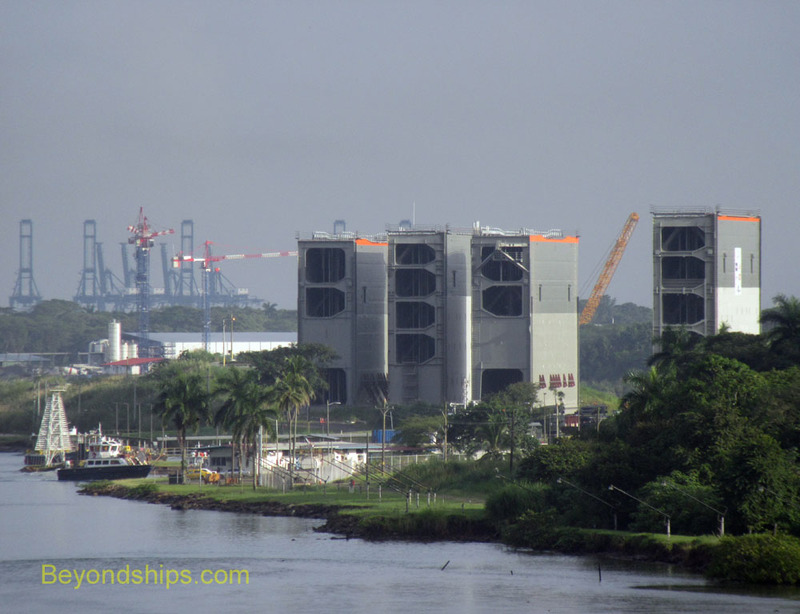 Once through the new Atlantic-side locks, ships will traverse Gatun Lake. The maximum operational level of the Lake is being raised as part of the expansion project. They will then enter the Culbebra Cut, which is being deepened. A new channel will connect the Culebra Cut to the Pacific-side locks. It will go along next to Miraflores Lake but because the water level of the new channel will be higher than that of the Lake, a new dam will divide the old channel from the new. Another new channel is being built from the Pacific-side locks to the existing entrance to the Pacific Ocean. Both the Atlantic and Pacific entrances have been dredged to handle deeper draft ships. Above: A mountains of earth from the excavation. Above: The new Atlantic-side locks under construction. Glimpses of the construction can be seen from the existing Canal. Forests of the types of crane used in building skyscrapers can be seen surrounding the new lock sites. 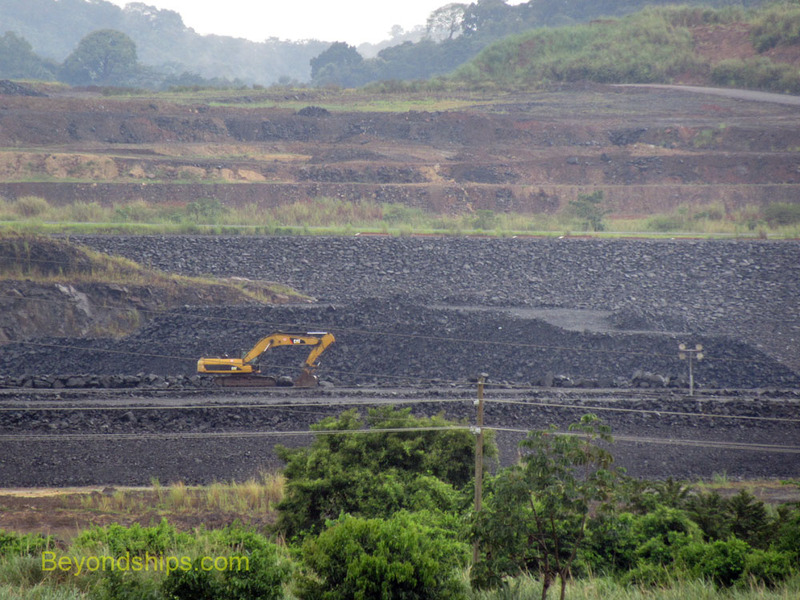 Earth movers and construction equipment can be seen excavating the new channels. When completed the expanded Canal will double the capacity of the Canal. In addition, its ability to handle larger ships will affect global trade patterns. To illustrate, cargoes bound from Asia to U.S. east coast cities in ships too large for the existing Canal have to be off-loaded on the West Coast and shipped overland to the East Coast, be brought around South America or be brought through the Suez Canal.. After the expansion, such cargoes can be shipped directly from Asia to the East Coast on the same ship. This is more efficient and economical. Ports on the East Coast (and around the globe) will have to adapt their facilities to larger post-Panamax ships. Along the same lines, exports of. raw materials and liquified natural gas from Gulf Coast ports to Asia could increase because of the Canal's ability to handle larger ships. Originally, the plan was to complete the project by the 100th anniversary of the opening of the Canal in 2014. However, the current objective is to complete the project by 2016.